Review of "ADIA" by Xavier P. and RadioIndy.com! Hailing talent and a voice well beyond her years, Adia accomplishes a mature and enticing CD with this self-titled R&B/pop release. The energetic “Loose It” demonstrates the hook-filled beats and loops that form the foundation of these groovy tunes. 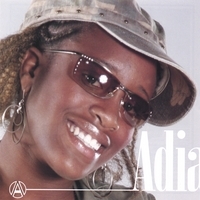 “I Got It” takes a more soulful twist, showing off Adia’s smooth, soulful vocal tone likened to the sounds of Aaliyah and Beyonce. Moreover, the emotion-invoking ballad “Wasting My Time” introduces the beautiful sounds of grand piano. Skillfully written lyrics that use repetition to its advantage make for tunes that are catchy and memorable. What’s more, the production of the CD allows Adia's beautiful vocals to shine through! Fans of JoJo and Aaliyah will get hooked on this fresh collection of R&B/pop hits!